Xiaomi Mi TV 4 is the world's thinnest LED TV at a thickness of 4.9 mm. The Mi TV 4 features a 4K display HDR with Dolby+ DTS Cinema sound support and is available at an affordable price of Rs. 39,999. The Mi TV will be available exclusively via Flipkart, Mi.com and Mi Homes from February 22. 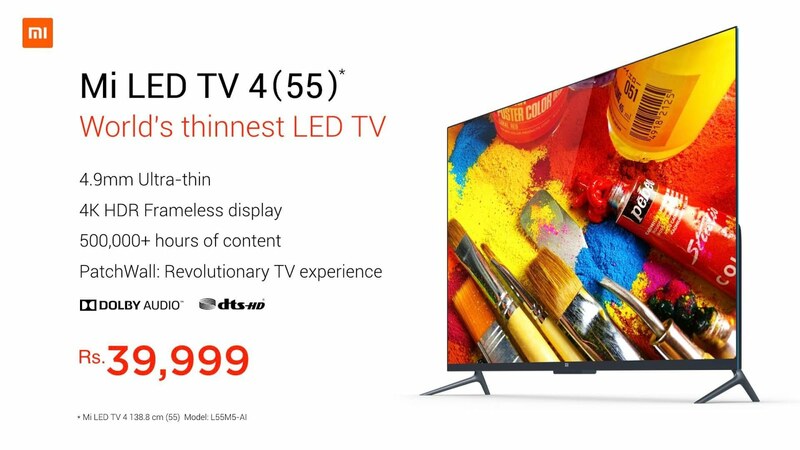 Xiaomi has launched the slimmest LED TV in India named, Mi TV 4. 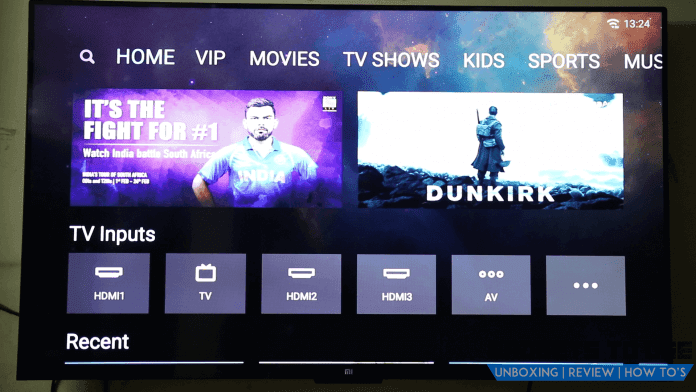 Xiaomi has already captured the budget smartphone market in India and with the launch of Mi TV 4, Xiaomi is planning to make its mark in the Indian TV market too. The Mi TV 4 is the thinnest LED TV measuring 4.9mm at its thinnest point and 38.9 at its thickest. The internet-enabled Mi TV 4 features a 4K display HDR with Dolby+ DTS Cinema sound support and is available at an affordable price of Rs. 39,999. The Mi TV will be available exclusively via Flipkart, Mi.com and Mi Homes from February 22. The Mi TV 4 is just 4.9-mm thick making it the thinnest LED and it weighs around 20kg. In the Mi TV 4, the panel has been applied directly to the glass back that gives it a thin profile. The bottom part of the TV parked the internals, power supply, speakers, and connectivity ports. On the connectivity front, the TV comes with 3 HDMI ports (one with Audio Return Channel or ARC for connecting a soundbar), two USB ports (one USB 2.0, One USB 3.0), an Ethernet port, AV input and good old antenna connection as well and a single S/PDIF port for audio output. The TV doesn't support the 3.5mm or RCA speakers and neither the Bluetooth enabled speakers. The TV remote basically looks similar to what you get with the Amazon Fire TV Stick and is quite simple, offering a D-pad for navigation, up and down volume controls, and a handful of playback controls. For now, the remote doesn't have any support for the Voice navigation. The Mi TV 4 comes with a 55-inch 4K HDR display with supports 4K resolution at 60Hz and HDR10. 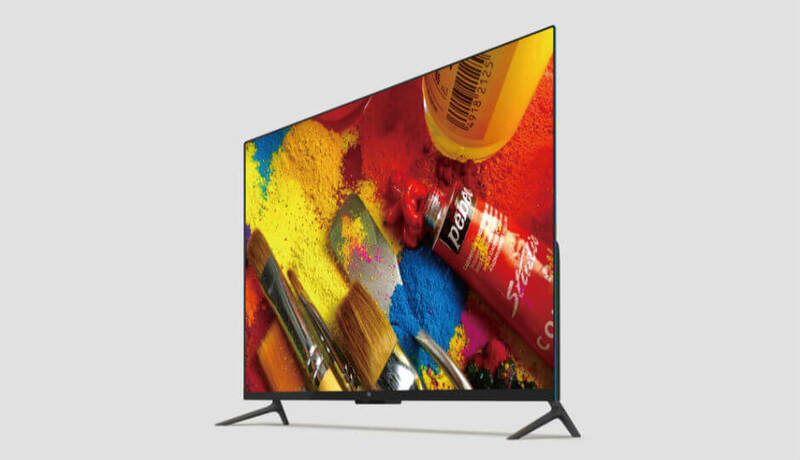 The LED panel on the TV offers wide colour gamut, intense colours – particularly reds, greens and yellows, and improved contrast ratio, though the panel is quite reflective. On the audio front, the Mi LED TV 4 supports Dolby audio and DTS-HD for improved audio quality. The TV has down-firing speakers but the overall audio output from the speakers fail to make its mark. The Mi TV is powered by a 1.8GHz quad-core Cortex A53 processor coupled with 2GB RAM and 8GB storage. On the UI front, the Mi TV 4 runs on the Android Open Source (AOC) platform. Although the Mi LED TV 4 runs on the Android-based Patchwall OS but doesn't support the official YouTube app or the Google Play Store. The only way to get apps on the device is to sideload them. For the ease of the average customer, Xioami is working on a unique solution. 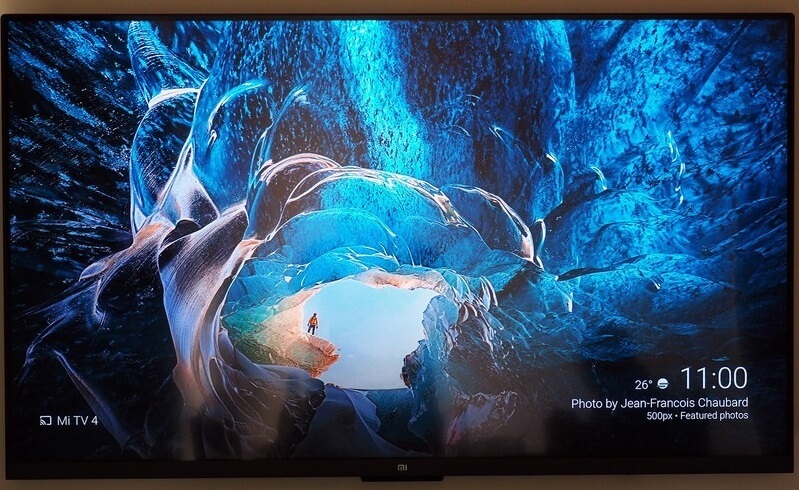 According to Xiaomi very soon users will be able to reflect their Xiaomi smartphone App on the TV. For user only need to download the app on their Xiaomi smartphone and if the smartphone and TV are on the same Wi-Fi, the app will reflect on the TV. Mi TV 4 comes with a UI designed for large-screen TVs, making it easy to find shows or relevant content. The TV also features large Menu and icons along with Universal search. 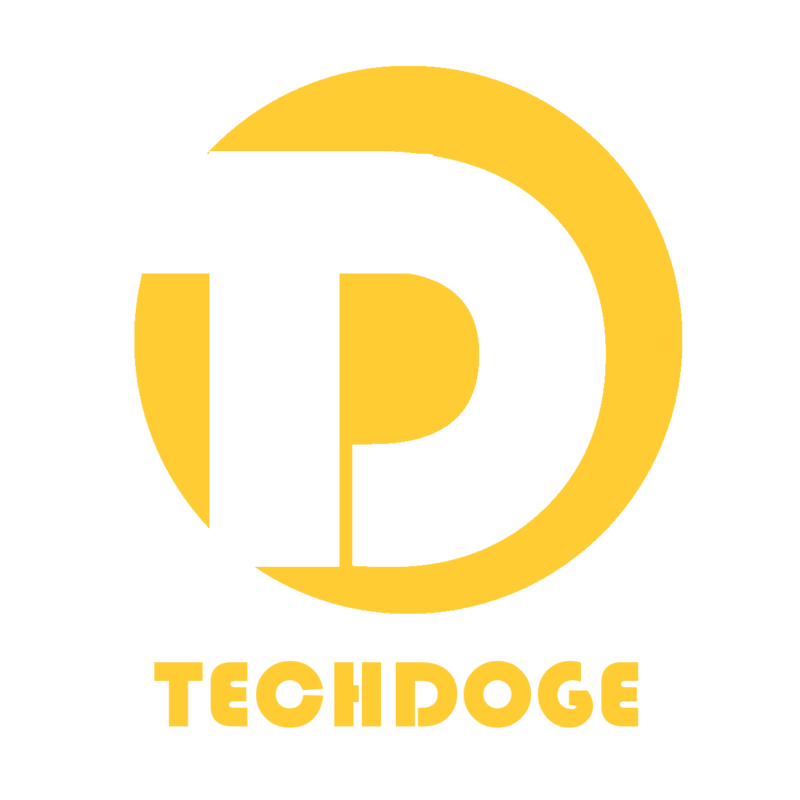 According to the Xiaomi, Patchwall OS is based on the Artificial intelligence and hence is able to understand the likes and dislikes of the user and can even suggest the best content to the users based on their interest. The functions of the TV can also be control with the mobile app. The Xiaomi has a total of 12 content partners( like Alt Balaji, Hotstar, Voot, Hungama Play, SunNxtlike and many more) on board at this point to provide its user with good quality entertainment stuff. According to Xiaomi, there are more services that will be active soon. Users will not need to do anything to implement the services (apart from subscribing to them). As long as the TV is connected to the internet, the update will happen automatically. The saddest part is that Netflix and Jio TV are not among the services that will be active soon. The services offered on the Mi TV 4 will be available in 15 languages overall - 14 Indian languages + English. 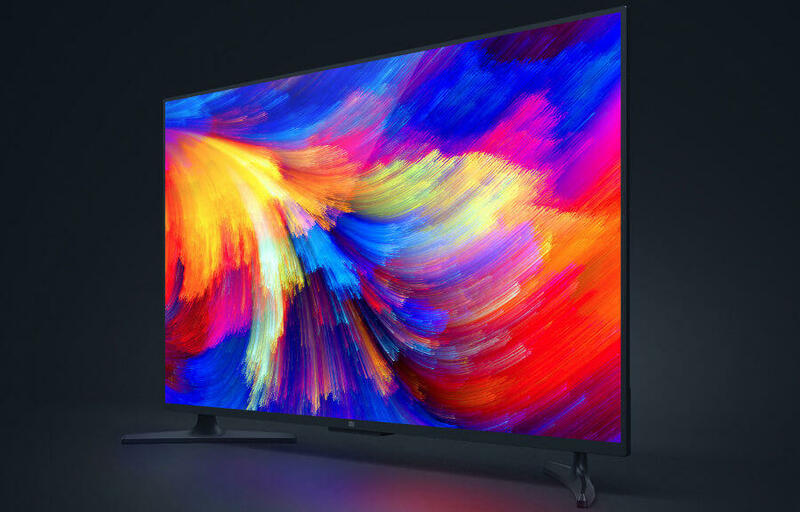 Currently, Xiaomi MI LED TV 4 is the most affordable 4K 'smart' TV and is loaded with lots of features. The biggest plus point for the Mi TV 4 will be its price with the combination of local content.